Your mini-golf question got me thinking: would you watch a PGA Tour event that took place on an ultra-complex mini-golf course? What? Yes. Definitely yes. And I never watch regular golf unless for some reason it’s the only palatable thing on TV or there’s some guy with a great beard or hilarious pants or something. Have you seen golf on TV? These guys are awesome at golf, no doubt, so it’s impressive. But it’s just golf guys hitting golf shots, all business-casual, and no matter how many times I say, “wow that guy hit one hell of a golf shot,” I’m always, in the back of my mind, wondering how that guy would fare with Randy Quaid in full hockey-goalie gear menacing him, Caddyshack 2 style. So yeah, I’m all-in for a PGA Tour event on a full-scale, impeccably maintained mini golf course full of hilarious obstacles, and preferably one that includes human defenders. Because as gorgeous as elegantly manicured lawns with rolling hills and smartly placed sand traps and water hazards can be, nothing is so beautiful as a stark-raving-mad Randy Quaid dolling out wedgies on behalf of the proletariat. In fact, I’d even go so far as to say I’d travel to play said full-scale mini-golf course, taking my chances against the Peter Blunt system. 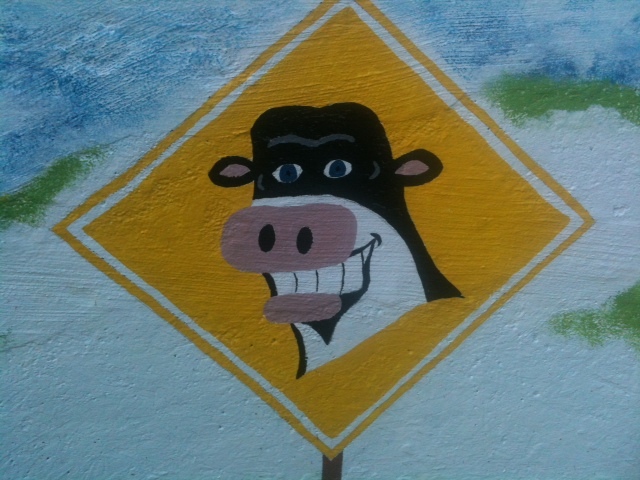 As for my mini-golf question from last week, this weekend I found a course that nearly met my requirements. Unfortunately, it’s not very close to New York. 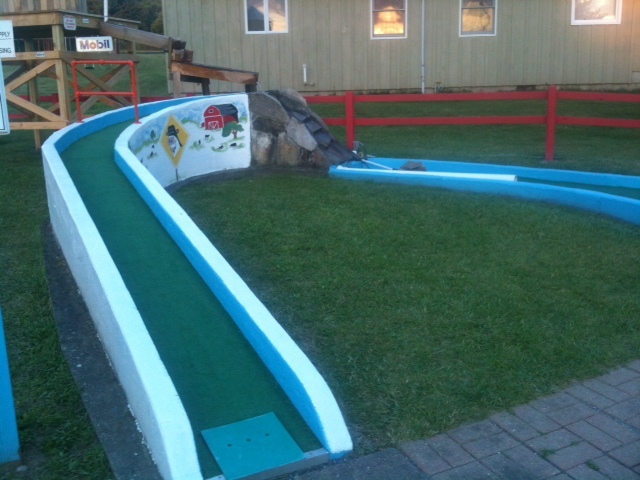 Last I played Sunset Playland in Bennington, Vt., the course looked forlorn, with too-trodden artificial turf guiding balls into holes and cracking concrete under empty one-time water hazards. Last I saw the place, it appeared closed for good, a sad reminder of fun times spent there with my family in summers past. We returned later to find that, indeed, Sunset Playland offered everything I was looking for in an outdoor mini-golf course, save the (rather important) short ride from the city. 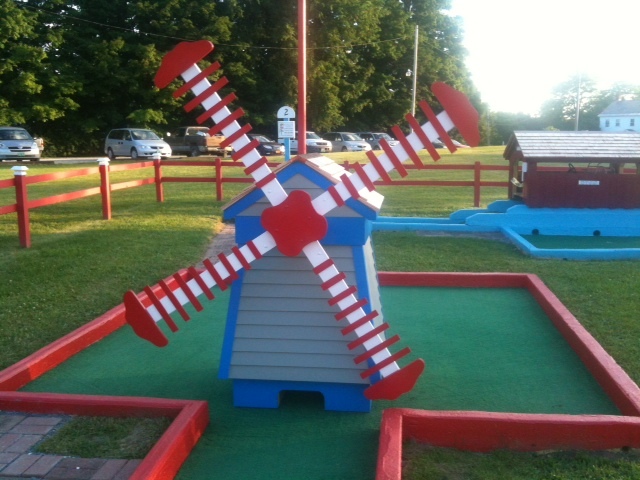 And, perhaps amped up by the discovery, I started off playing as good mini golf as I can ever remember. My wife is normally good for nine competitive holes of mini golf before she loses focus and fades on the back 9, but this time she struggled from the outset. The battle, from the outset, was between me and par for the course. Now, I don’t know who determines the par on a mini-golf course, or even, really, why there always is one noted on the scorecard. I’m not aware of any USMGA. At many places — including Sunset Playland — the pars for many holes seem somewhat arbitrary, with plenty of par-2s more difficult than par-3s, and so on. But as far as I’m concerned, once you’ve cemented a victory over everyone else in your party, every mini golfer should play to beat the course’s par. At an amateur level, this sport is about personal bests, after all. And I must admit now that I’ve never parred or beaten the par for a mini golf course in my life. Maybe you have and you’ll tell me about it in the comments section. I won’t be ashamed. My mini golf game normally hinges on the type of high-risk, high-reward play that often results in a couple of sixes on the scorecard and at least one frustrated on-course meltdown. This time, I played conservatively from the outset and shot two-below on the front 9. Perhaps due to nerves, my game grew shakier on the back half of the course, and I bogeyed a couple to fall even. The 15th hole featured a barn obstacle with a tunnel only slightly larger than the golf ball in its base and an obvious wimps-way-out around the side. Sitting even with par and realizing this was my chance for mini-golf glory, I shot for the tunnel and nailed it. On 99 percent of mini-golf courses around the country, putting one cleanly into such a tunnel with the right amount of force means a hole-in-one or a gimme putt for 2 — which would have been good for a birdie. But here, apparently, the tunnel was a trap. The ball rolled straight out the backside into a rocky hazard, and it took me an extra stroke to play out of it. Plus one. Getting the ball to the top of the incline requires a strong putt, but a ball hit too hard that misses the hole on top might bounce off the rocky waterfall and roll all the way back down to where you’re standing. It needs a perfect touch, and one I apparently lack. I hit the ball way too hard, sending it skipping up the incline, where it hit against the back wall and bounced into the grassy area between the incline and the green. Since the course’s final hole — the ball-collector hole — is a Par 1, I needed a miracle. Rather than taking the one-stroke penalty and providing myself some forgiving drop on the course, I opted to play through from the grass. This is definitely not safe or sanctioned mini-golf play, but par was on the line. So I chipped the ball back toward the green, successfully launching it over the concrete barrier and, in fact, right on line with the hole. But it bounced over the hole and off the course again, destroying my dreams of glory. After another failed chip, I took the drop, humbled. This entry was posted in "Sports", Words by Ted Berg. Bookmark the permalink.